Few weeks ago I discovered a new ingredient, Lavash bread. I have always seen it on Middle Eastern grocery shops in West Ealing but I never thought about trying it until recently, and what a discovery! Lavash is a type of very thin bread native to Turkey, Iran, Georgia, Armenia and Azerbaijan. The bread is a beautifully versatile ingredient that can be used to make pastries, borak and even oven samosa. For those of you familiar with Syrian breads, lavash is somewhat a cross between Saj bread and Tanoor Bread. In Ramadan pastries has an essential role on the Iftar table. It adds a nice variety to the meal and nice side to a warm bowl of soup. Cheese, meat and spinach are the classic fillings. For today's recipe I tried to create a cheese filling that doesn't require a trip to a Middle Eastern shop. I wanted to make a cheese filling that resembles the taste of that used in cheese borak in Syria but without the use of any "specialty" cheeses. I will have to say, the experiment was a great success. Even better than I expected! Of course using Lavash bread defies the purpose of this whole exercise. 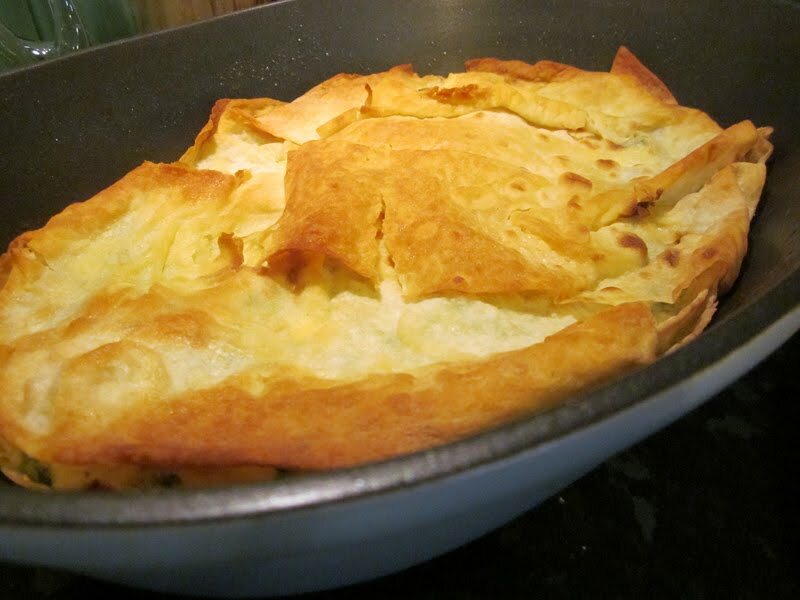 So if you want to keep "high street supermarket only" tag to your dish you can use filo pastry or even puff pastry although the latter will produce a completely different dish. Mash the feta cheese with a fork and mix it with Mozzarella, chopped parsley, egg, salt and freshly ground black pepper. If your mix is too thick you can add a splash of milk. Be careful not to add too much other wise you will end up with a soggy pastry base. Butter the bottom of a small baking tin. Add two layers of the bread brushing each layer with melted butter. Spread halt the cheese mixture then another bread layer, more cheese then the top bread layer. Brush the top generously with butter to get a crispy finish. Bake in the oven for twenty minutes until the top is golden. Let cool for few minutes, cut to individual portions and serve. Sometimes simple things can lead to momentous discoveries! Love the sound and looks of this dish and the Lavash bread is a big favorite of mine! I am thinking it might be yummy too in an Armenian pizza form, don't you think? This looks great for vegetarians. Who can resist cheese and bread :) Lovely recipe.. Thanks! It will definitely work on Armenian pizza. In Damascus cheese fatayer (mana'eesh) is made with ground cheese mix similar to this. you welcome! Although I am a big meat eater myself I do like a bit of vegetarian food sometime. Syrian (East Mediterranean in general) offers great choices for vegetarians. Omg this looks absolutely DIVINE. I am SO gonna try it tomorrow! I hope I can find Lavash bread in the supermarkets here in Dubai...if not, will have to stick to filo pastry I guess. Yum yum yum. If I can find Lavash bread in London then you shouldn't have any problem finding it in Dubai! If you tried it let me know how it went. Apparently they have Lavash bread everywhere here :D I'm making it tonight. Will let you know how it goes! Uhm... reading your blog from Barcelona, travelling to Syria next 4thSept.for 3weeks (not first time, I love your country). Holidays por fin!It's a pleasure to read your posts. Taking note also of your favourite places to enjoy a good meal ;-) Shukran jazeelan! Welcome to my blog. I am so glad you like the blog and even happier that you like Syria that much. I hope you like the places I recommended. Ok, I tried it last night. I can't believe how easy it was!!! It was delicious but a tad salty - I think I won't put any salt in next time as the feta was a bit salty. I also used akawi cheese as well, maybe that added to the saltiness. Btw, I couldn't find lavash bread! So much for it being easily available. I used Saj bread instead. Kano - did you find the Lavash bread in the frozen section or fresh? I am so glad to be of help! I think the combination of Akawi and Feta made it too salty. You can se-salt akawi cheese and run fresh water from the tap over it for 20 minutes or so (check my cheese cake recipe). And Saj bread, even more Syrian. I used fresh one this time but you can find frozen one or some alternative in Turkish supermarkets. A thing of beauty, a work of art. If only I could eat it. Welcome to my blog! Thanks for the nice words. I am so glad you guys liked it. 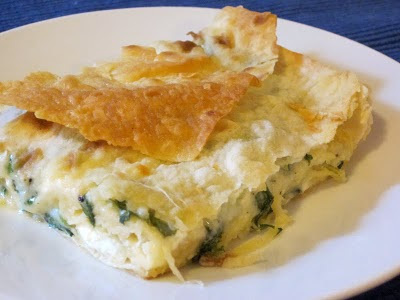 I made with puff pastry before and I loved it as well. a different dish but equally good. If you can't find lavash bread you can use Syrian saj bread, or if in Geneva (I am sure you have Turkish shops) you can use Yufka pastry which is somewhere between lavash bread and filo pastry. Nada said, Saha wa alf hana. Oooh, I am so pleased that I happened upon your blog - this idea to use lavash is brilliant. We always have lavash available in our small local shop. I don't know why it didn't occur to me before! Welcome to my blog. I am so glad you like it. Hi, I don't suppose you know of a mail order supplier of Lavash do you?